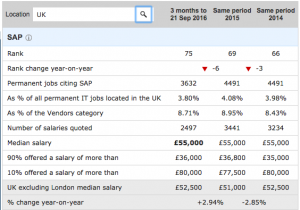 What is the SAP Job market in the U.K like? 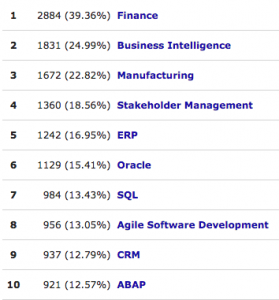 SAP has now become world's third largest independent software supplier. SAP has started with the launch of the R3 system. Sap has been clear of its vision to provide innovative best value products to its partners. SAP has opened a huge demand for people who can work on this software and help the companies run the software at their premises. With the innovation in technology like HANA Sap has opened SAP job market in UK & a massive channel for growth to HANA consultant. Not only HANA, but there has also been an increase in many other SAP modules which has lead to open a flush of jobs in the SAP market. The data explained in this article is originally taken from a third party independent source IT jobs watch. Figure1 Is a detailed view of the job market for over a period of three years 2014-16. The comparison is given to make you understand the SAP Job market UK flows over the last three years. The median salary stands at £55,000 in the previous three years. There is also increase in the UK excluding London median salary range over the last year. In Fig2, We have taken data for the top 5 regions to make it easy for you make your assumptions and focus on the areas which have more demand in SAP. The market vacancies have seemed to be increased as compared to the last two year whereas the number of opportunities is more in England. It is also important to note that the median salary in region London is more than the rest of the areas sitting at £ 62,500. In Fig:3 We have taken top 10 modules of IT where the market trend has moved. It is very clear that in the U.K Finance has a major role and demand for SAP finance and BI professional is at 39.36% and 24.99% and on the lowest side is SAP ABAP and SAP CRM with the order of 12.57% and 12.79%. This top10 chart gives a good insight into the market trend, and you can base your decision based on the ranking of all and need plus the salary range. SAP HANA was an innovation over traditional R3 systems. 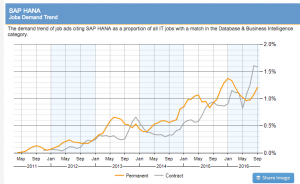 The job market trend of SAP HANA on the below chart shows that there is a considerable increase in the demand for HANA consultants over the last 3 to 4 years for both contracts as well as permanent roles. With people looking for a career change or people looking to move to SAP HANA have the right time to make a decision and join the much demanding SAP market. The excerpts below are from payscale.com. 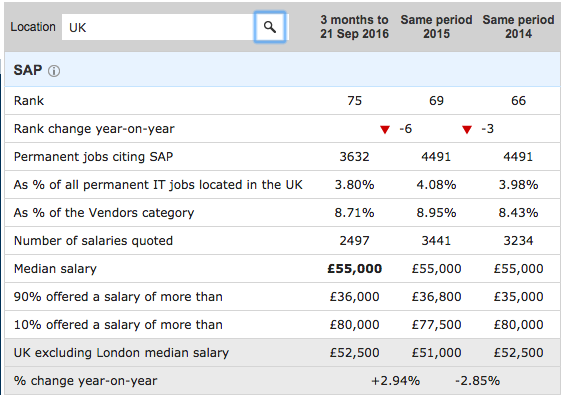 The median salary for a sap consultant sits around £ 47,215. The range starts from £28,000 and goes up to £69,000. The range depends on your experience as well as your expertise; no one range fits all. We are sure that we have given you an insight into the SAP Job market UK. We have tried to bring the figures and facts from independent third party sources, so that we can provide you with unbiased view of the SAP job Market UK. There are many factors that you may have to keep in mind to ensure that you are getting the right knowledge from this article. Factors such as your experience within the SAP industry, your education background, your skills gained as well as your knowledge about the market and business itself.